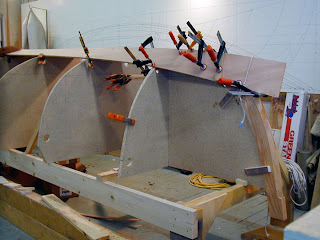 The keel has been finished, set up on the boat, and bonded to the stems. I have checked and adjusted the sheer marks on the molds with my batten, and will measure the girths at each station in order to determine the plank widths. 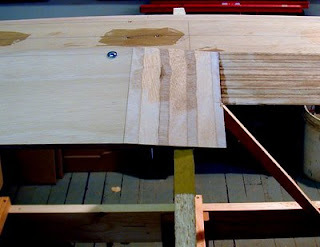 Walter Simmons recommends hanging the garboard plank first before final lining off of the remaining planks, and this is the way I approached the job. I made the garboard a little wider than the rest of the planks, and let it climb the stems as high as I felt was reasonable. I let the hood ends land above the load water line at both ends. I checked the run of the garboard with my batten as well. Checking and adjusting the sheer curve. 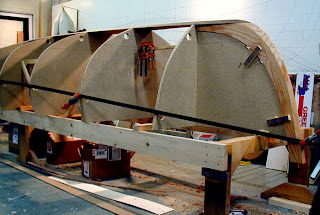 Each end of the garboard was spiled to rough shape, then clamped to the boat and marked at the molds. I decided I would glue up the plank scarfs right on the boat, rather than pre-scarfing the plywood. This proved easy to do, and saves a bit of material as well because the tapers can be flipped end to end on the sheet of ply. 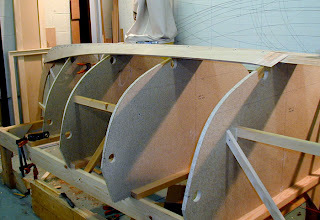 I should mention here that I had quite a rough time with the garboards up forward. I cracked the first plank that I tried to twist around the forefoot, and thought I might have to resort to boiling the ends. I had scrimped a little on the plywood, buying 5 ply, 9mm Joubert instead of the much more expensive 7 ply Shelmarine from Greece. I had only bought two sheets though, so I broke down and ordered the good stuff for the lower planks. This 7 ply material and a closer attention to my clamping methods was a success! The aft port garboard, cut to shape and taped off for easy cleanup of the epoxy. I like to use temporary washer-head screws to fasten the garboard to the keel and stem. There are a lot of holes to fill later, but it saves fiddling with all those clamps. The screws put the plank right exactly where it was hung dry, so there is no chance for slipping. The subsequent planks will be screwed only through the laps at each mold, and clamped elsewhere, so there are fewer holes to fill. I will leave in the temp screws in the hood ends, and replace them later with bronze screws. The first plank is hung! A close-up of the scarf. I made these 4" long, which is a little better than a 10:1 ratio. 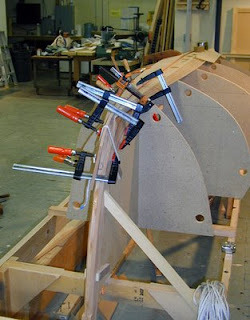 A lot of clamping pressure, and careful placement of the clamps and pads are needed to twist the garboards around the forefoot. Now it's time to do the rest of the lining off. 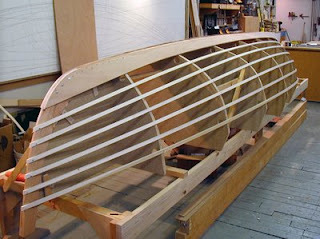 Lining plank for lapstrake boats is a real art, and an otherwise good boat can be spoiled by a bad job. 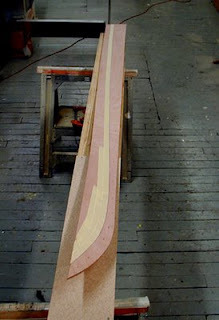 I felt that I really needed to see the planks shapes on the boat, so I made a set of lining battens from poplar dressed to the width of the lap, 3/4" in this case. 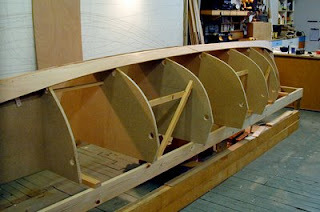 It is common practice for the next plank up from the garboard to be a little wider than the remaing planks, to offer a transition from the wide garboard to the narrower bilge strakes. Also, some thought must be given to the width of the rub rail at the sheer, because that will reduce the apparent width of the sheer plank. I re-measured the girths from the garboard to the sheer, subtracted the width of the rubrail, and divided this by the number of remaing planks. A set of dividers set to this width was then used to step off the planks around each mold and at the stems. 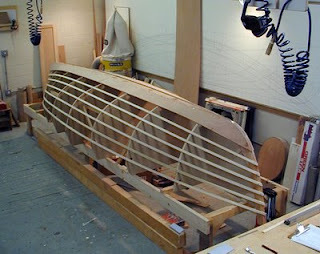 I then put on all of the lining battens to these marks, and had a good look at the boat from all angles.